Prior to going to Beau’s Oktoberfest on Saturday, I went to T&T Supermarket (Ottawa location) and stumbled into this Coca-Cola flavour. 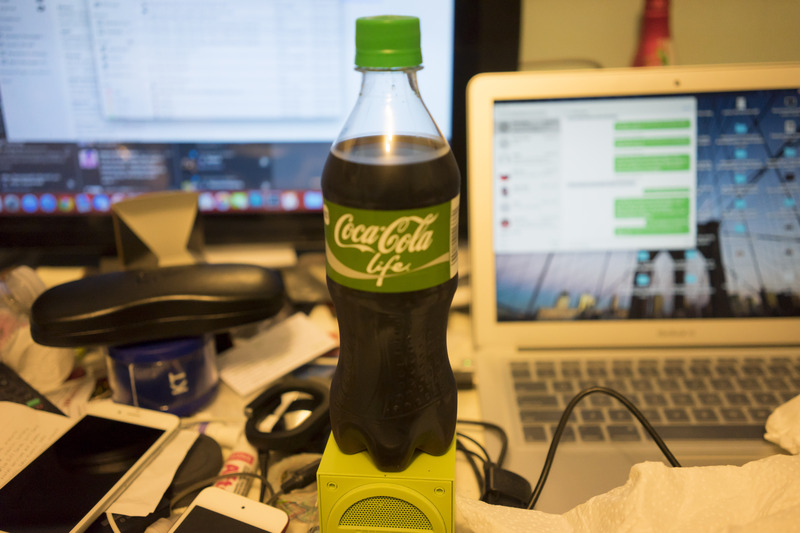 Imported from Japan, it’s Coca-Cola Life. I was pretty curious because of its green packaging and not knowing much on it. There’s some Japanese words on it which is unique than the Cokes in North America. I had a taste on a Sunday and to my surprise, it didn’t taste very sweet and very rich. From what I read on Wikipedia, it uses sugar (less amounts than normal Coke) and stevia instead of corn syrup/fructose used on original Coca-Cola. It’s somewhat in-between Coca-Cola Zero. I would think that it would taste like Mexican Coke, which I tried at El Camino awhile back but it’s different in tasting. There you have it. Not sure if T&T will restock more of it as I took the last bottle. The price goes for $2.79. It’s pricey than the usual 500ml bottles, which has been the new norm in 2015 as Coca-Cola is lowering calories in their products. Check the photos below.